Lisa-Marie Leihy loves to travel and blog about her Sunshine State adventures at Tampa Bay Parenting Magazine. Getting away from the big city has never been more convenient or luxurious than our recent visit to The Ritz-Carlton Lodge at Reynolds Plantation. Located an easy hour drive southeast from Atlanta, this lodge is worlds away from the hectic pace of our modern day to day lives. The 251 room resort is set on the banks of Lake Oconee amongst beautiful old pine and oak trees and the natural landscape and architecture is breathtaking, but what makes this resort extra special are the ladies and gentlemen who are charged with making your stay as perfect as possible. The porter unloaded our car and escorted us to our room. He told us about the resort and made us feel right at home. Our cozy fourth floor room had a small balcony with tables and chairs overlooking Lake Oconee. Wrapped in comfy bathrobes (even one just the right size for our six year old) we enjoyed breakfast as the sun came up and evening coffee under the stars. The lodge lobby was like a warm, welcoming handshake from a dear friend. We kicked back in comfy seating areas set up alongside tables with board games. Each evening we played checkers and shared our favorite memories of the day while we listened to local musicians play and enjoyed a variety of yummy menu treats served by the sweetest hosts. The guys played pool and watched sports on TV in the lobby bar while the ladies relaxed by the large fireplace and the kiddos went on a Treasure Hunt with maps in hand. Internet access and those comfy lobby couches were not enticing enough to keep us indoors- we ventured outside to make s’mores every night! The staff had everything ready for us to create our fireside treats including hot cocoa or cider. For dinner, our six year old rolled down the hill towards Gaby’s by the Lake where the motto is “No shoes, no shirt, our pleasure.” Since it was chilly, we decided to keep our shoes on. The chef has crafted an impressive collection of regional dishes mixed with his unique experiences from Kansas City and New Orleans. He uses fresh, local ingredients including his award winning Coca-Cola Ribs entree. The shrimp and grits were melt in my mouth delicious and the ribs…ah…I’m still dreaming about the combination of Thai flavors! Everything looked just as amazing as it tasted which pleased my six year old to pieces. I’d plan another stay at this resort just to try everything on this chef’s menu which happens to change with the seasons. I leisurely strolled along a covered paved pathway to The Reynolds Plantation Spa next to the main lodge. The sunshine and beautiful landscaping made an ideal transition into the two-story stone front spa. The staff delightfully spoiled me from the moment I was greeted at the welcome desk. Spa slippers and robe, citrus infused water, tasty snacks and lots of magazines and books about the area kept me comfy during my spa visit. In addition to the sauna, steam room, and hot tub, I got to experience one of the spa’s most popular and unique services, the Oconee Rain Treatment. Incorporating local Creek medicine of the Four Elements of healing: fire, water, air, and earth, my combination lavender dry brush, massage with hot and cold stones and luxurious Vichy rain shower was by far one of the best spa services I’ve ever had! I felt energized and relaxed, ready to hike in the woods or kick back by the indoor pool. Since the spa’s indoor pool was only steps away from the locker rooms, the pool won. Every afternoon, the indoor pool is open for family swim and has plenty of towels, pool noodles and kick boards readily available. The pool area’s large windows, hot tub, comfy lounge chairs and high ceilings made me feel like I was in my own personal sanctuary. I felt completely relaxed and daydreamed about how I could make this visit to The Ritz-Carlton Lodge last longer. Our six year old had the chance to participate in the half-day Ritz Kids program while I retreated to the spa. She loved everything about her Ritz Kids adventure, especially the Mad Hatters Tea Party. They made party hats, decorated cupcakes, crafted jewelry boxes and bracelets. They went on outdoor adventures where they learned about the natural habitat, met Jerry the bullfrog and giggled on tree swings. They even made up their own play in the outdoor Pollywog Theater! The ladies working with the kids were amazing. They worked so well to make the experience fabulous for each child and really enjoyed their role as party hosts. Our daughter wanted to visit the staff at the Ritz Kids throughout our stay and planned to invite them to her birthday party as well as play dates back home. Even though it was a bit chilly outside, we found the outdoors irresistible! We wandered along hiking trails, played in the sand at the lake front beach, shot horseshoes and basketballs, splashed in the heated outdoor infinity pool then hopped in the hot tub to unwind. The kids made friends quickly and played on the playground while the grownups relaxed in full view of their games. They resort has canoes and bikes for rent but we opted to enjoy the ice skating rink which is complimentary for resort guests. After strapping on our skates, our six year old gleefully taught herself to skate while holding onto one of the helpful sleds. It was absolutely wonderful! 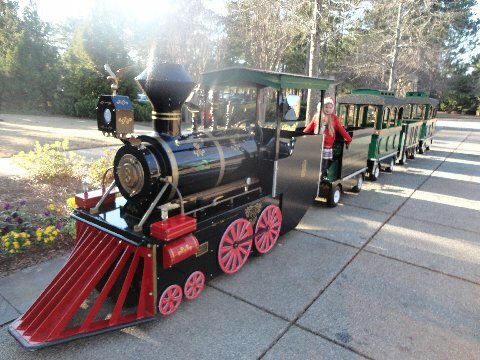 We also had the privilege of riding the Linger Longer Express, a tiny 26 passenger train, that toured the beautiful grounds. Our six year old was thrilled with the attention she received as she waved to guests passing by so we rode the train more than a few times. We spotted eagles, deer and even a fox strolling in the forest surrounding the beautiful resort and took in the amazing mixture of natural beauty, great service and incredible luxury that The Ritz-Carlton Lodge provides. Read my full review of The Ritz-Carlton Lodge at Reynolds Plantation. Been there? Share your scoop! Disclosure: Special thanks to The Ritz-Carlton Lodge at Reynolds Plantation for hosting me on this adventure. As always, the opinions expressed in this article are my own. What a beautiful resort. Is that an infinity pool next to a creek? WOW! Tina…it is a beautiful resort. The infinity pool is right next to Lake Oconee. It is an amazing place to visit! Wow! This place looks AMAZING! That pool and lake. Wow!